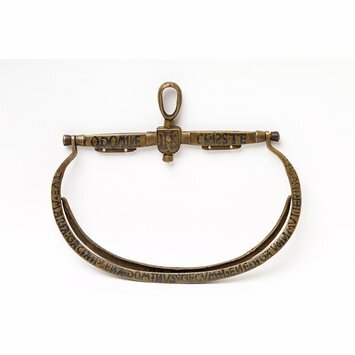 This metal purse frame was a luxury personal accessory made in the Renaissance period (about 1450-1500). It is decorated with niello. In this technique the metalworker engraved a pattern or design onto highly polished metal and filled the incised lines with a hard black alloy. The alloy was formed of silver, copper, lead and powdered sulphur. The cold powdered alloy was spread over the design and the metal object was then heated. The alloy fused and filled the engraved lines and spaces. When the piece cooled, the metalworker scraped the alloy off the surface leaving only what had sunk into the incised pattern. The surface was then polished to show the black niello design in dramatic contrast. 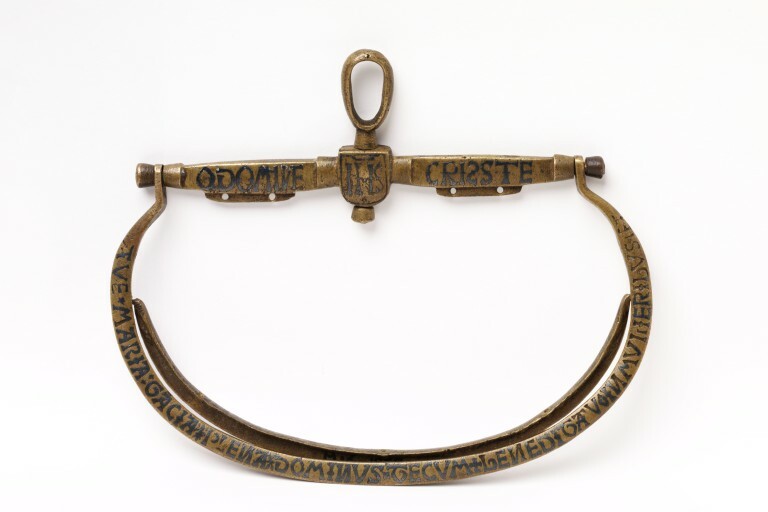 Comprises a top cross bar with shield-shaped centre through which runs the looped swivel for attachment to the girdle; on the underside are two lugs each pierced with a pair of thread holes for the attachment of the purse. Pivoted at each end of the cross bar is a bow-shaped frame, its flanged inner edge pierced with thread holes. A similar, but smaller frame is pivoted to it about a third of the way from the top. Found near Binham Priory, Norfolk, ca, 1850.